I was having trouble using a hand plane to flatten my workbench top. The plane was having tear-out, and despite trying a backbevel, the blade continued to tear out. This is my first time trying a hand plane, I basically don’t know what I’m doing. I decided to try the router sled method to flatten it. The router sled in my case consists of two 2×6’s and two 2×4’s. 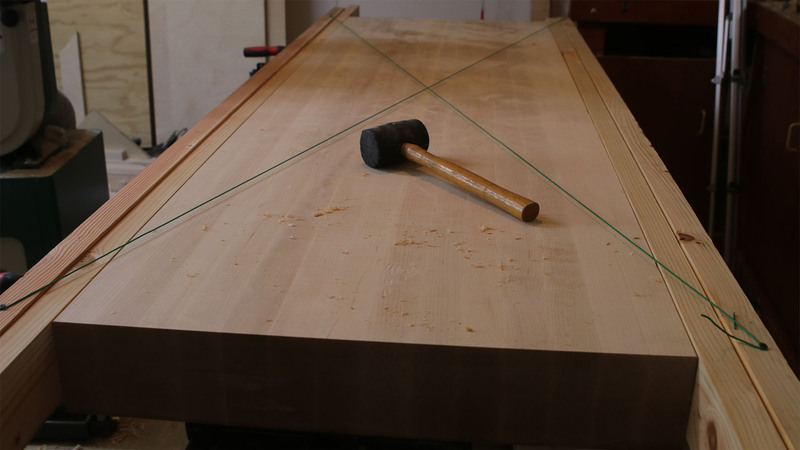 A 2×4 and 2×6 get clamped to each side of the workbench top, 2×6’s on the outside. 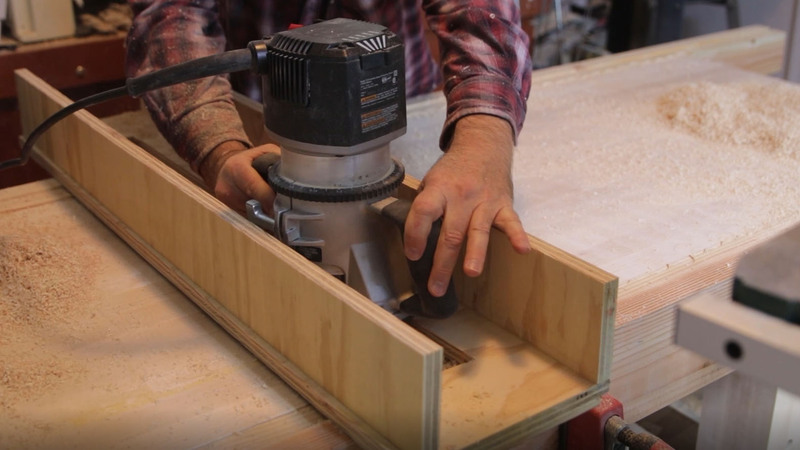 I then made a router sled out of 3/4″ plywood. I started by ordering a 1.5″ bit for my router. This wide bit (relatively speaking), allows fewer passes across the width of the workbench to do the entire length. I then made a router sled out of plywood. 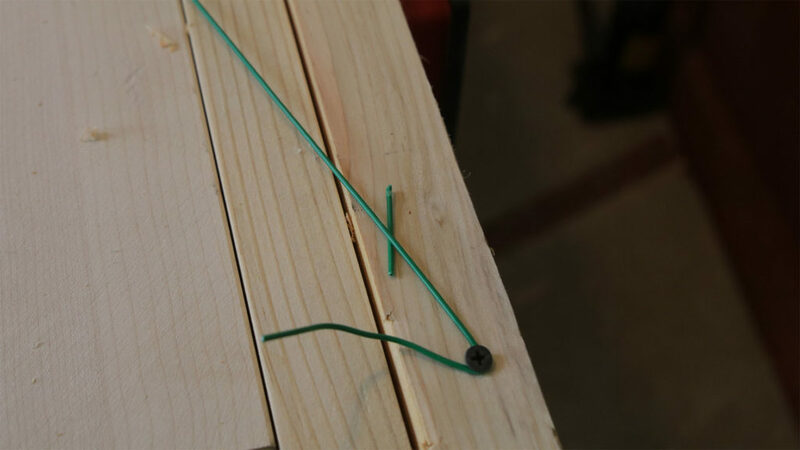 Make this long enough so it will span your workbench, plus the side board you clamp on. I made the base wide enough for my router base, plus a little room, about 1/16″ for the router to smoothly slide back and forth, plus the width of a piece of plywood on each side. 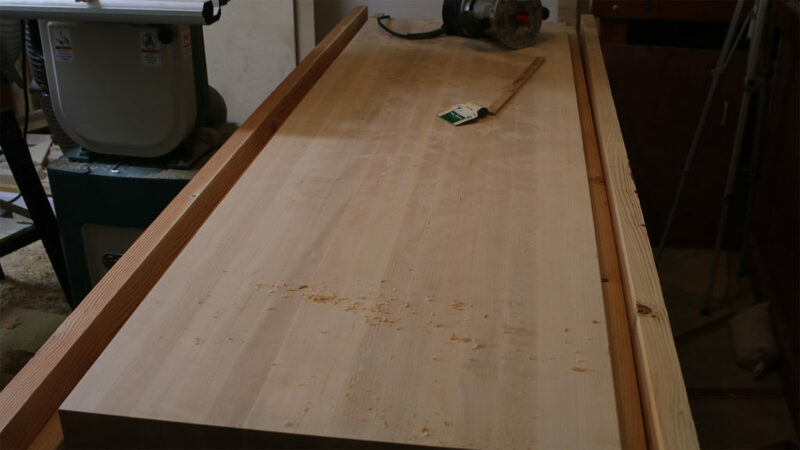 Cut two pieces of plywood the same length, but about 4-5″ high for the sides of the router sled. 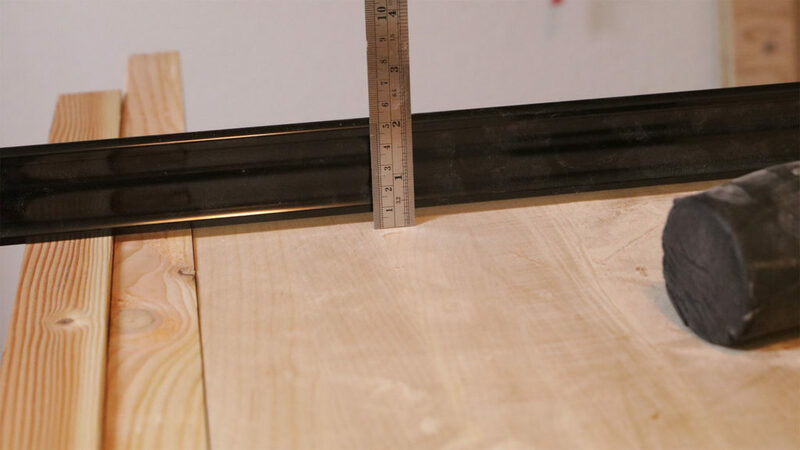 The bottom edge should be very straight – we want these pieces to support the bottom piece of plywood so it doesn’t sag with the weight of the router. Glue on or screw the sides on, making sure your router will slide all the way back and forth. I then cut the slot down the middle, about 2″ wide, with the table saw. I let the base move down onto the blade, and cut two slots that didn’t go all the way to the ends. This slot needs to be a bit wider than your benchtop. 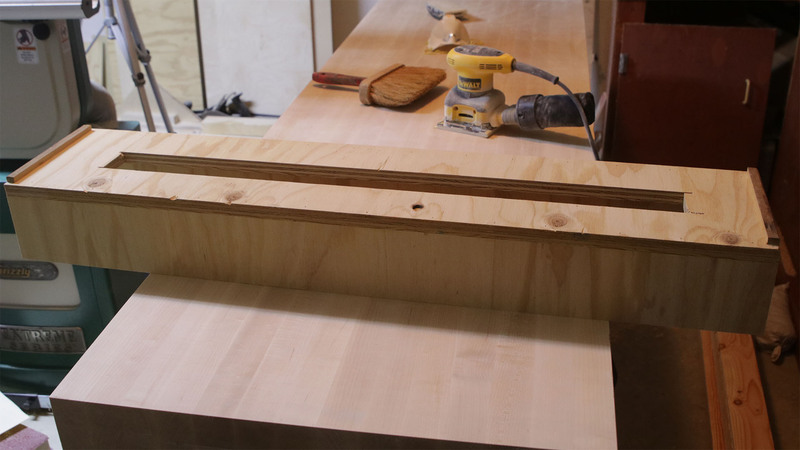 If your workbench is 24″ wide, make the slot maybe 26″ long. I then made the side cuts and finished the slot with a jigsaw. I glued on two pieces of wood on the bottom of each side. These stops will help keep the sled from sliding off the 2×6’s as you go across the bench, one pass at time. If it slips off, the bit is going to suddenly dig deeper and gouge the top – not a good thing! I clamped a couple board onto the legs below the top, about the height that when I set a 2×6 on them, the 2×6 would be about 1/4″ proud of the top. 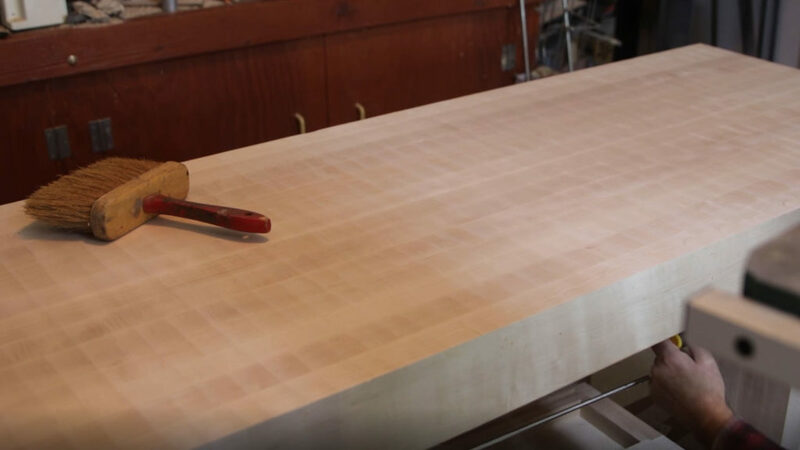 I used the planer to smooth one side of the 2×4 I put against the workbench top, so that the rough 2×4 wouldn’t be making impressions on the side of my workbench top. Of course, the top edge of each 2×6 should be very straight. I put mine thru the jointer and got these flat and straight. Clamp 2 boards under the bench to help you hold the 2×6 and 2×4 on each side of the top. I also jointed the side going against the legs, so the smooth board would dent the legs all up being clamped to it. Then set a 2×4 on each side of the benchtop, followed by a 2×6. If you put the cross pieces under the bench at the right height, the 2×6 should just be slightly above the workbench top. 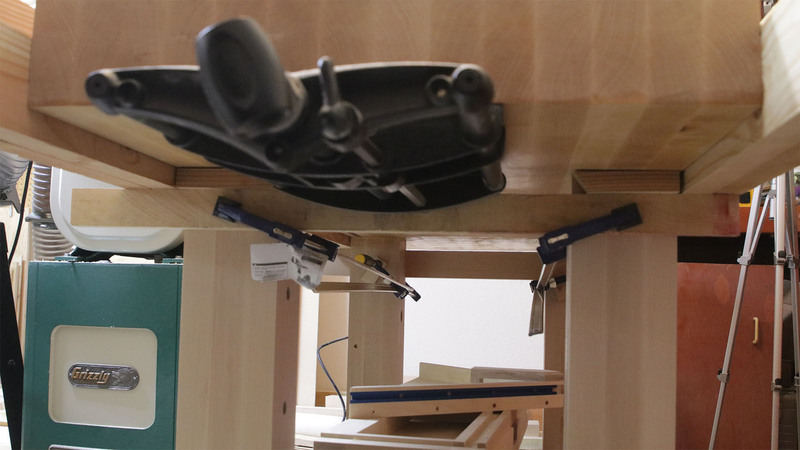 Now use three clamps, one on each end, and one in the middle to hold the 2×4’s and 2×6’s securely to the top. The two braces clamped under the bench aren’t necessarily needed, but I did use them to put blocks under the 2×4’s to help hold them up to the level of the top while I tightened the three clamps holding the 2×4’s and 2×6’s on. The boards should look about like this, when you tighten the clamps, pull the 2×4’s up to be about even with the bench top. I actually used a few scraps of wood and put them on the cross brace to help elevate the 2×4’s to the proper level. After you get the boards clamped up, you can measure and get the 2×6’s evenly up about 1/4″ or so. It can be any height above the top, it doesn’t really matter, except you don’t want it too high or your boll will have to extend too far to reach the top. You can adjust the boards with a rubber mallet, to hit them a bit lower or higher. This should move them in the clamps a bit. It isn’t as critical that your workbench is level, as it is flat. This next step is what will make it flat. I got some wire and stretched diagonally across the 2×6’s and across the top, attaching to the 2×6’s with sheetrock screws. Make these as tight as you can get them. You want these wires to just barely touch in the center. The upper wire needs to be elevated at each end the height of the wire, so clips off a couple short pieces of the wire, and put under it at each end. Tap the ends of the 2×6’s, a little lower or higher until they just barely touch. If you push the bottom wire down, the top wire should not move, if you push the top wire up, the bottom wire should not move. If you push down on the top wire, the bottom wire should start moving at the exact moment the top wire moves. When you have this set, make sure your clamps are all tight, at this point you don’t want those boards slipping or moving at all. You can remove the wires now. Now find the lowest spot on the top. I used a precision straight edge, and a steel ruler to check for the lowest spot. Since I was going to be removing a thing layer off the entire top, I just wrote these in pencil where I measured. Then set the router sled there, place the router in it, and adjust the height of the router until it just touches the top. The setup is the most important part. Now it is just making pass after pass across the top to remove a thin layer of wood. I made sure and set the speed on my router a little slower for this large bit. The top speed is listed on the container for it. I then started the air filtration, put on my dust mask, and hearing protectors, and started in on it. Make sure you keep sawdust from getting under the sled. I lifted that up and swept under it often. It went rather well. There was slight lines in the top from the bit I could see. Some light sanding removed most of that, and it now looks awesome. I’m glad I picked the router sled method. The 2×6’s and 2×4’s were re-purposed for some lumber racks, and I saved the router sled part for another project, another day. The finished top, before any sanding. Notice the very slight bit marks going across the top. These sanded out easily.